We were at the asi conference in Athens last week talking about differences in attention to advertising across media channels. Regular readers will know, of course, that not all impressions are created equal: big ads get more attention than small ads; print display ads often get more attention than digital display ads; video ads have a better chance of being noticed than static ads; and so on. These attention differentials have a knock-on effect for both long term brand building – as Ebiquity have also found – and short term sales. But the audience in Athens was interested in TV and OLV. How does pre-roll compare to the other media we track? The short answer is that it rocks. Below, you can see the ‘attention curve’ for ads in different channels. The data in the subsequent charts either comes from our UK desktop panel, or aggregated results from bespoke tests we have conducted for OOH, Print and Mobile over the last five years. 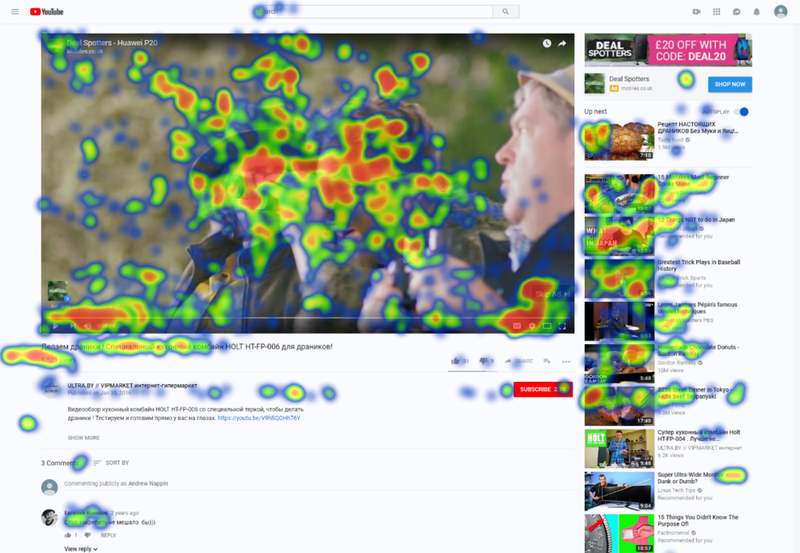 It shows the percentage of people who notice an ad at all, and the percentage of people who look at ads for at least 1 second, 2 seconds, 3 seconds and so on. Two things to note: this data is cumulative, so people could glance at an ad three times for half a second each time, and we would record the aggregate attention to the ad as 1.5 seconds. And we have applied the same viewability standard (50% of the ad, for 1 second or more) across all the media, so that we can compare like with like. What it shows is that pre-roll ads, either on publisher sites or on platforms such as YouTube, get a boatload of attention. If a pre-roll ad is viewable, then it is almost guaranteed to be viewed, which is highly unusual. And it is likely to get viewed for much longer than other media and formats that we track. Roughly 40% of viewable print ads get 1 second or more attention; roughly 80% of viewable pre-roll ads get at least a second, and over half of them get over 4 seconds of attention. By way of comparison, only about 6% of desktop digital display ads get a second or more attention. This superior performance is driven by a mix of factors. Creative plays a part: advertisers try harder to make pre-roll advertising interesting and engaging, whereas display ads are often churned out willy-nilly. If more effort went into creative development of display ads, then the results might be better. Until then, junk in, junk out. But there are two other factors that drive the results. Firstly, size matters. As we have said before, bigger ads get more attention than smaller ads. Pre-roll ads just take up more pixels than almost any other form of advertising we track, and, crucially, take up a far greater proportion of the screen – often 100% of the screen. There’s simply nowhere else to look. Of course, some people still find a way to avoid the ads: they look away from the screen or open up a new tab or look at the comments below the video. But it’s less of a problem than you might think. It seems that we have to make more of an active effort to look away from a pre-roll ad than you do from other formats, and while few people actively want to watch the ads, far fewer can be arsed to actively avoid them. Which brings us to the second reason that pre-roll ads do so well: we are forced to watch them. It seems that if the content is worth it, we’ll sit through quite a substantial portion of an ad to get to it. Below, you can see the percentage of people who are looking at each second of a pre-roll ad as it plays. 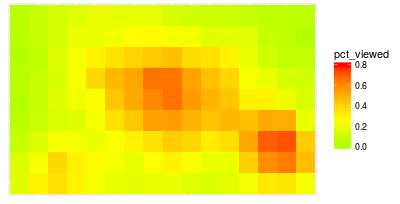 This means that it’s different from the aggregate attention curve that is shown above. 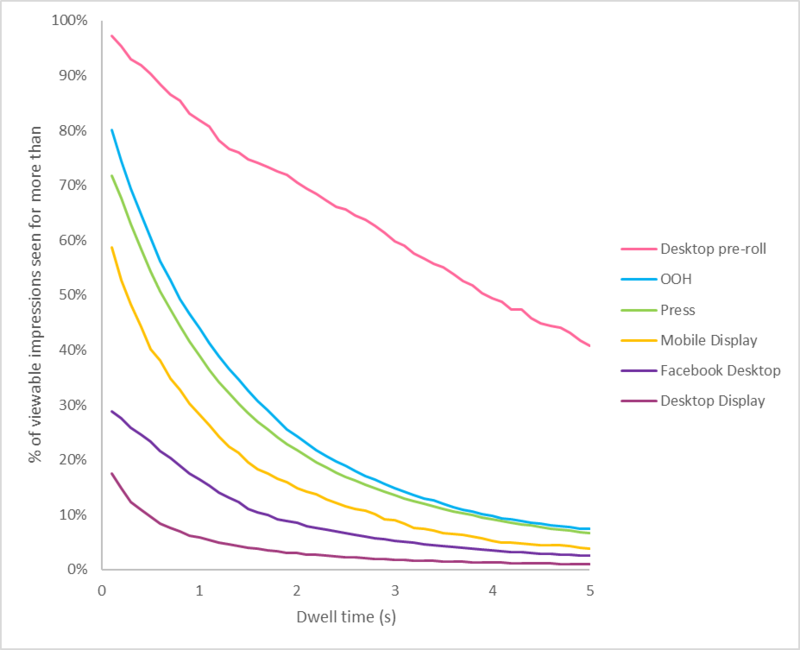 It’s also worth noting that this data is exclusively from desktop computers, and not from mobile, which has different attention patterns. What this shows is that at any given time, about 60% of viewers are actively engaging with pre-roll ads – and that this is just as true for 20” non-skippable ads as for 6” non-skippable ads. If people are forced to watch the ads, then watch them they will. Of course, if they are not forced to watch them, they won’t. If you look at the line for the skippable ads, then that declines quickly over time. But the drop off is less precipitous than you might expect. 60% of viewers stick with the ads for 5 seconds or so, which is the sort of result that we only ever see for double page spreads in Print. This may be down to the fact that it may take people a bit of time to find the skip button on desktop – and modern ‘ecstasy of fumbling’. Or it could be down to the fact that pre-roll creative is, relatively speaking, quite good, and people don’t mind giving the brands a few seconds of their time. Creative is really important. Check out the mad heat in the bottom right hand corner – which is where the skip button is. Pretty much everyone looks there. And there’s some secondary heat in the bottom left hand corner, where people are obviously looking at the clock to check how long they have to endure the ad for. As you can see, by far the majority of the attention of the ad goes to the centre of the screen – on the action of the ad. People don’t hate-watch the skip button: they glance at it, and then watch the ad until it’s over. They may prefer not to watch an ad, but hey, what are you going to do? You’re getting free football highlights or cat videos once it’s done. What does this mean for advertisers and publishers? Firstly, that that they should treat pre-roll very differently from display. Pre-roll is what you might call a ‘sequential’ media, where ads follow content which follows ads, whereas print, OOH and most digital formats are fundamentally ‘simultaneous’ media, where the ads and the content compete for attention at the same time. Given that we can only focus on one thing at a time, and that ads are usually less interesting than the content they accompany, ‘simultaneous’ media are at an inherent disadvantage to ‘sequential’ media. In response, ‘simultaneous’ media owners, such as newsbrands or social media platforms, should strive to simplify their sites to reduce clutter and increase standout of their ads. The Guardian’s commitment to ‘fewer, better ads’, served in prominent locations, makes it far closer to a ‘sequential’ media owner than many of its competitors. Facebook’s in-line ad formats take up much of the prime real estate of the desktop screen, and consequently are more ‘sequential’ in nature. This is part of the reason that desktop ads on Facebook get 50% more attention than the norm. Secondly, we should re-evaluate skippable ad time lengths. There’s a move in advertising towards 6” video ads across both TV and digital at the moment. In their place, I am sure that they are quite useful. At the same conference in Athens, the Yan Liu of TVision gave a fascinating and compelling presentation about their utility on TV. But Yan was quick to point out that while 6” ads get looked at and can be well remembered, they are best used to trigger established memories, rather than building them in the first place. If you are in the business of making memories, however, you may need more than 6” to get the job done. And it seems that pre-roll advertising may be actually quite a good way of delivering these longer messages. Many consumers are prepared to stick around for 20” to get to the content that they want to watch. This may seem like a long time, but it’s less than the 2-3 minutes we have to endure on terrestrial TV in the UK (and 4-5 minutes you might have sit through in the States). Further work will have to be done to calibrate the optimal timelength in this ‘attention exchange’, but at first look, pre-roll looks like an ‘attention bargain’ for the advertiser, the publisher and, crucially, the viewer.